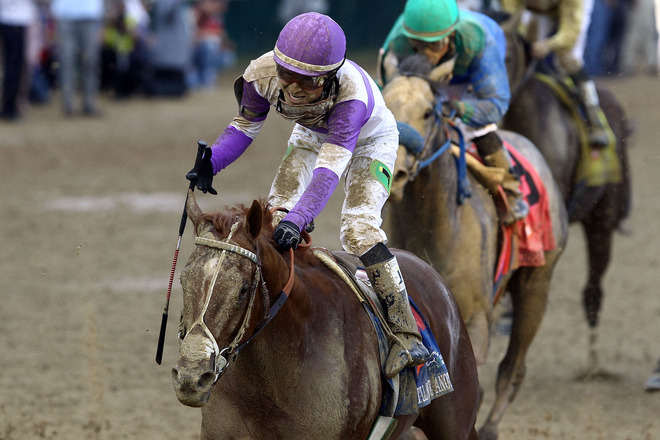 Handicapper James Scully said yesterday that if you are looking for an upset at the 2012 Kentucky Derby, I'll Have Another could be that horse. And look who came out on top in the 138th Run for the Roses as the colt with the 12-1 odds was the victor. Bodemeister, who had the second best odds at 5/1, was setting a record pace going into the stretch but I'll Have Another was able to roar past Bodemeister for the win. This is the first Derby title for Mexican jockey Mario Gutierrez and trainer Doug O'Neill. This was the first win ever for the horse in post 19, the second post to the outside. I'll Have Another now has a chance to be the first thoroughbred to win the Triple Crown in 34 years if he wins the Preakness at Pimlico Race Course on May 19 and then the Belmont Stakes at Belmont Park on June 9. Here's the complete finishing order. Did Phil Mushnick just say that? Is Mariano Rivera's career over?